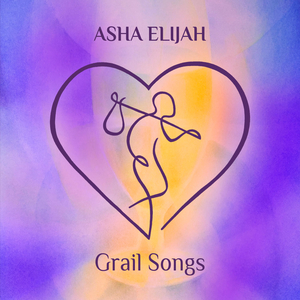 “Grail Songs is a collection of original works composed and recorded in Hungary, where I’m now chiefly based. The inspiration also comes from what I’ve felt called to in this land: twin-flame love and loss; spiritual teaching & community; Holy Spirit; Grail mythology; humanistic music & poetry; nature, magic, mystery & friendship, and poppy-seed cake! I feel compelled to migrate geographically, and to purify spiritually with a kind of loving insistence experienced inside and all around me; in short I feel like I am coming home both at an inner and outer level. The opening track ‘Dance with me’ is like a courtly Renaissance ballad, where Truth sings to love! 'I need to be loved’, which follows, is a long, plaintive, heart-centered declaration of both faith and vulnerability. Then comes the more upbeat ‘The giver’ which has a vibrant Spanish feel. After that is a very tender ballad of thanksgiving simply entitled ‘Budapest’, about the adopted city I live in and love so dearly. ‘I can’t take you out of my heart’ describes the connection I have to my twin-flame and muse, over a love that seems lost at the ordinary level, and yet has enduring meaning at the higher level. Three ‘winter’ songs follow: ‘All my mistakes’; ‘I’m so sorry’ and ‘White and gold’. The first two are songs of atonement and redemption, and the latter was inspired by coming into land on one of my frequent commutes between Budapest and London, and seeing the lights of the villages twinkle over the snowy landscape. ‘Wedding day’ was composed after being invited to the wedding of Hungarian friends, and it also has a higher, alchemical meaning. ‘The letter’ is an improvised piano piece that I later orchestrated and wrote a poem to, on the YouTube of it. It is a poem of gratitude to God. The penultimate track is called ‘Carry me home’, and starts with a theme of renunciation, but finishes with joy and a sense of glory. Finally, I composed a Hallelujah chorus to my favourite-ever piece, Pachelbel’s Canon, having played my own arrangement, and my friend and colleague Yloush (Székely Ilus) then also added her own Latin prayer of peace. The result is a joyous ode to higher love 'Song of peace'. The Grail, exoterically is the chalice in which the blood of Christ was collected; the chalice used in the Last Supper. Esoterically it is that vessel in our being into which Holy Spirit pours when we have sufficiently purified mind, body and soul. The Grail knight is the guardian of the Grail, and the moral upholder of the chivalry and virtue that is needed in order to purify. In Hungarian myth they say that the crown is in the parliament, but that the Grail is underground, meaning that the crown is symbolic of our outer relationship to life, but that the Grail is symbolic of our inner relationship… buried deep within our souls.